The Euro 2016 football championships got underway in France this weekend. 24 teams from across the continent will battle it out over the next four weeks to be crowned the finest international football team in Europe. 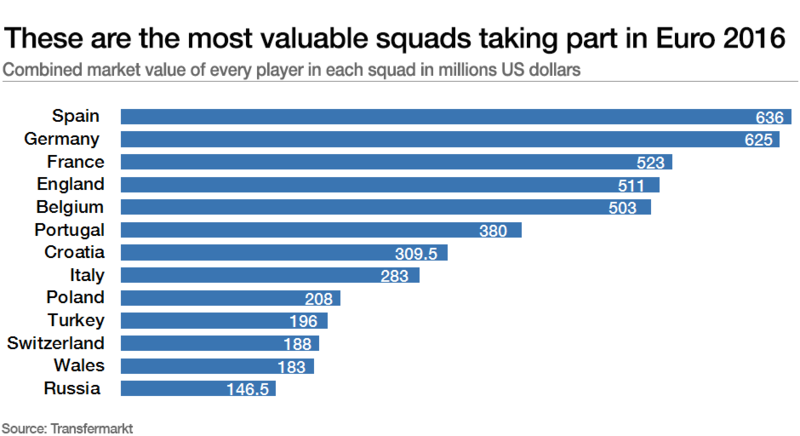 Football database website Transfermarkt has ranked the participating nations by how valuable their squads are. This was calculated by adding together the market values of every individual player in each squad. The value of each player was worked out by taking into account their recent performances, consistency, and potential, as well their international experience and marketability. Host nation France are in the top 13, as are perennial disappointments England. Scroll down to find out the most valuable squads that will be taking to the field over the next few weeks.